Game schedules have been posted to our schedules and standing page!! Check out some of the upcoming events hosted by Beaumont- Cherry Valley Recreation and Parks District! Join us and show your support! ♦There's so much to do at the Pancake Breakfast! ♦Meeting your manager and finding out which team you're on is the reason for the whole event, so make sure you stop by at some point that morning to check the rosters and find out where your child's name is listed! ♦If you've registered and paid, but you haven't already received your $25 worth of raffle tickets from your registration, you will need to stop by our raffle ticket table to pick up your five! ♦Many of our board members will be present to answer questions and help with your concerns. ​♦AND there’s an INEXPENSIVE AND TASTY breakfast made by our local Lions Club, available if you’d like! Give mom and dad a break from cooking and dishes - feed your family at our Pancake Breakfast! Just $5 for adults, $3 for kids 12 and under, and free for children under 3. Stop by the front table as you walk into the MPR at Mountain View Middle School and purchase your breakfast tickets! Calling all coaches!! Did you know that USA Softball So Cal puts on some amazing coaching schools?? Eastern District is happening this Sunday! 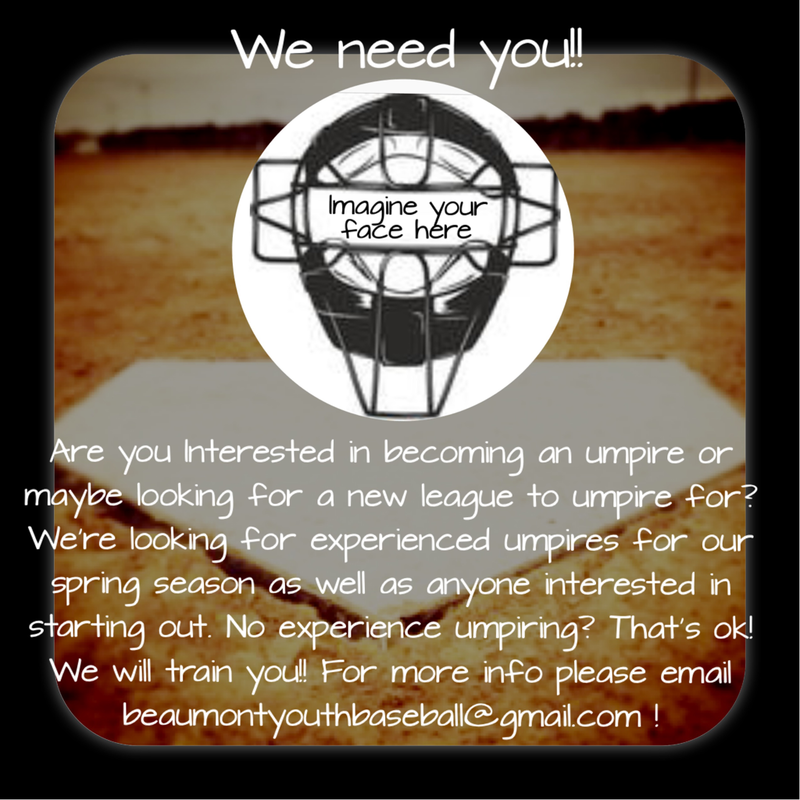 If you’re interested in attending send an email to beaumontyouthbaseball@gmail.com and we can get you registered! 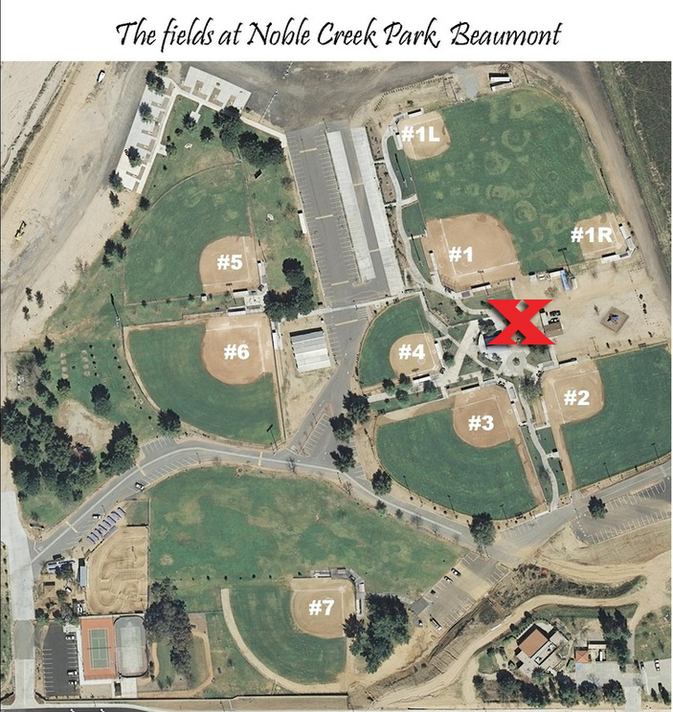 Our signups are held in our BYB office at Noble Creek Park in Beaumont, California. We will have the necessary forms for registration, so all you need to bring is a copy of your child's birth certificate (we'll verify their age and then you can have it right back!) and a form of payment (cash, check or credit card). 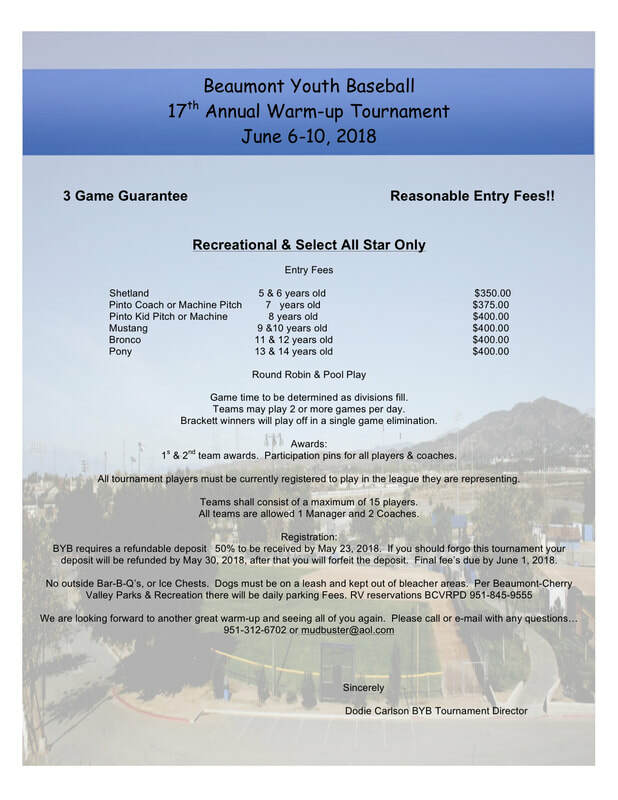 If you'd like to print your own registration form and fill it out prior to coming to the office, head to the "rules and forms" page and download the player registration form. Along with your registration, you will receive FIVE raffle tickets - these are YOURS, to keep or to sell to others, at $5 each, to put in your own pocket toward your registration cost. 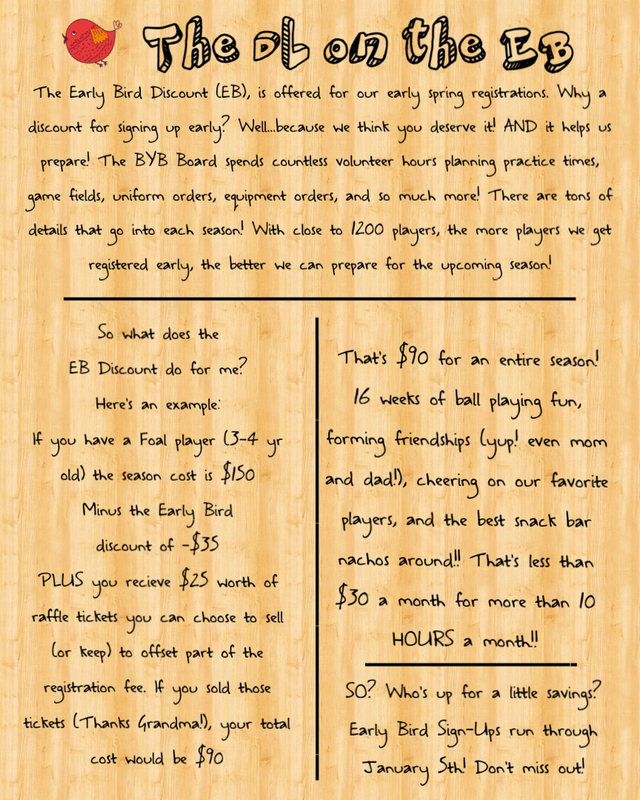 That means, if you sign up in the Earlybird time frame AND you choose to sell your raffle tickets for $25, you could be taking $60 off the regular registration price. If you choose to keep the raffle tickets yourself, you are more than welcome to do that, they are yours! You can put your name on them and return them to the office by opening day 2019 to be entered into a drawing for many great prizes! ANY player who is playing baseball in divisions Pinto 7 and older and ANY player who is playing softball in divisions 8u and older MUST attend one of the evaluation dates. If my player played last year, does he/she need to attend evaluations? Yes! Player skills develop and change over the course of the year. It’s important the information we gather on evaluation day is the most current. Player evaluations are done as part of our team placement system. We do not hold a draft with coaches, but rather ask the evaluators to assign a numerical value to each player. Those numbers are placed into a computer draft and teams are assigned and balanced based on numerical values. We have several coaches from our community, high schools and sometimes colleges, who attend and evaluate players. They are skilled in recognizing the mechanics of baseball/softball. Reassure your players that mistakes can happen and as long as they do their best, the evaluators are looking at their mechanic before their execution of the skill. IE : they want to see if you know how to catch, not if you can catch every ball thrown at you. What if we can’t attend either of the dates? 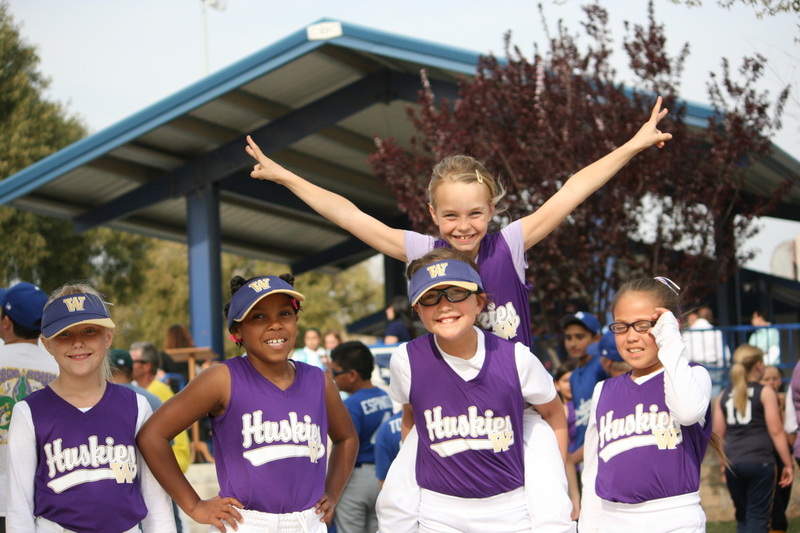 We provide two dates so that every player can attend and ask that you try your best to attend one of them. If there is some extenuating circumstance that prevents you from attending either of the dates, please email beaumontyouthbaseball@gmail.com . A BIG thank you to all the teams, players, coaches and fans that attended our tournament this weekend!! We got to see some great baseball being played! We wish you the best for your All-Star season and hope to see you back in 2019! It's almost time for our annual Warm-Up Tournament! If you are interested in participating, please see the flyer and registration form below! ♦Now that games are scheduled daily on the fields at Noble Creek Park, the old practice schedule for February is no longer valid. From now until the end of the season, practice fields around town are available on a first come - first served basis. To hold a field for your team, you must have four players one adult present. ♦As you're driving through Noble Creek Park, please drive slowly and safely, avoid parking in red zones, parking in front of gates or in restricted areas, and please leave room for emergency vehicles when parking in areas that obviously need to stay clear (like the back of field 1 toward the open meadow). Hi Beaumont baseball and softball families! 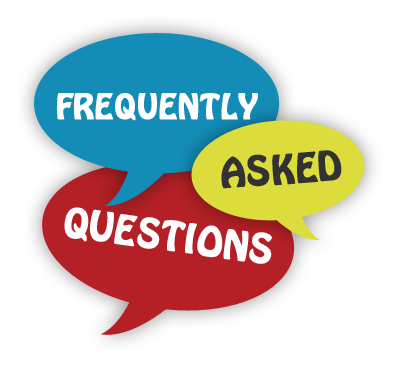 We have been getting lots of questions about weather, game cancellations, and how and why we make decisions regarding both. Hope this helps! ♦Decisions about field closures are based on field conditions as it pertains to the SAFETY of our players. ♦Your player MIGHT still play a game in sprinkles or light rain. ♦The decision is usually made around 3 p.m. or after unless it's been raining so hard all day prior to 3 p.m. that it's an obvious decision. ♦Some of the fields at Noble Creek Park drain differently than others. Sometimes just a specific field will be closed, sometimes the entire park. ♦Foal teams who have had games cancelled: your games will be rescheduled toward the very end of the season when the weather is more predictable. ♦Shetland teams who have had games cancelled: depending on how many games your team has had cancelled, you may have some games rescheduled toward the end of the season. 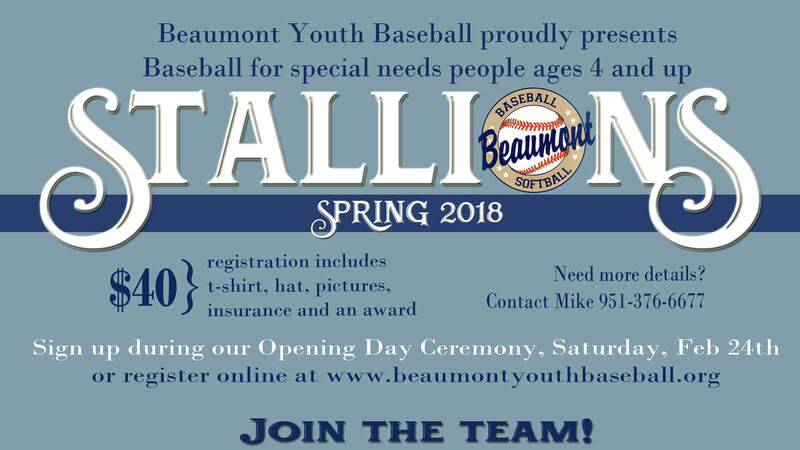 On behalf of the entire Board of Directors for Beaumont Youth Baseball and Softball, we thank you for coming to our Opening Day Carnival, Saturday, February 24, 2018. We loved your booths, we thank each team who took the time and effort to conduct a carnival game booth representing their team. We love seeing the players working their booths, enjoying other teams' booths and spending time together with friends, family and community. Congratulations to all of our raffle prize winners. If you were a winner but weren't present to pick up your prize, rest assured, we called the number you printed on your ticket stub and left a message that you've won something. Thank you to our great vendors, including State Farm and Cindy Cabanas, Mama Mayhem Designs and more. Also, thanks to Lazer Legacy in Yucaipa for donating free games of lazer tag! A special thanks as well to the Beaumont-Cherry Valley Recreation and Park District staff, including those who parked and set up our trailer stage, and General Manager Duane Burk, who gave an update on the future of Noble Creek Park and ball fields. Excited to get this season off to a great start, and so grateful for our players and their family. ​We're proud to be BYB. you can sign up here by clicking the button at the top of this page. Our in-office sign up dates have passed, so online is the best way to go now! ​We couldn't have gotten through the past few weeks without the help of some very consistent and reliable volunteers. We thank all who came out THREE WEEKENDS IN A ROW to help with evaluations, and all who spent our Pancake Breakfast morning helping out in various ways. We appreciate all the help we can get, and we are sincerely glad for your helping hands. ​If you’ve received an email like this, it’s a simple issue we are working on right this moment. Anyone who registered in person at one of our in-office registrations dates, we then have to get your info into our computer system somehow. So as we are inputting that info, when we get to the “checkout” page, if you’ve already paid, we don’t currently have a way to show you’re paid, but we DO HAVE RECORDS THAT YOU PAID! It’s just a case of the computer and the human not seeing eye to eye, so we are waiting for the fix. Our player agents have worked too quickly inputting a lot of people, so lots of these emails went out. But rest assured, if you paid, we know you paid. Disregard this message for now if you’ve paid. Thank you for understanding! (only for players in divisions for ages 7 and up. Foal, Shetland and 6U players do NOT participate in player evaluations). Players are expected to attend the evaluation in a "practice-ready" mode - meaning they'll be wearing the proper baseball/softball/athletic attire they'd need during a practice. If you don't have baseball/softball pants yet, don't worry! Just wear some athletic attire you can play in. If you don't have cleats yet, don't worry! Just make sure you're wearing some sort of athletic shoe you can run and play in! This is a no-stress situation - hopefull your child thinks evaluations are a little fun - it's a good time to reunite with former and future teammates! Pony Baseball/16U Softball: 9:00 a.m.
Bronco Baseball/12U Softball: 9:45 a.m.
Mustang Baseball/10U Softball: 10:30 a.m.
​Pinto 7&8 Baseball/8U Softball: 12:30 p.m. Registering your player BEFORE the evaluations (by attending a sign up date in our office OR by completing online registration will save you time. HOWEVER, you will be able to register your child on the date of evaluation in our office, just come a little early to give yourself time to complete the required forms. We're so excited for Spring 2018! Our signup dates are listed below, and they're held in our BYB office at Noble Creek Park in Beaumont, California. We will have the necessary forms for registration, so all you need to bring is a copy of your child's birth certificate (we'll verify their age and then you can have it right back!) and a form of payment (cash, check or credit card). 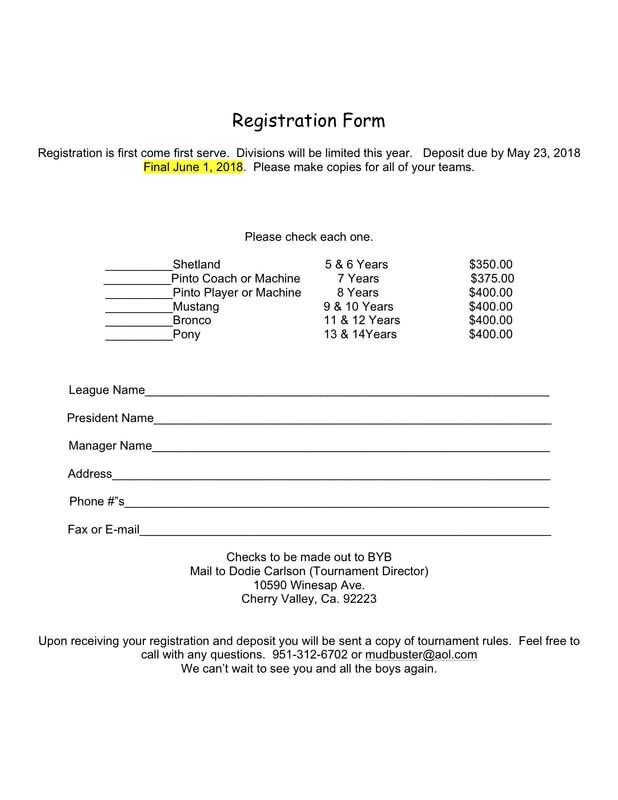 If you'd like to print your own registration form and fill it out prior to coming to the office, head to the "rules and forms" page and download the player registration form. ♦Saturday, October 28, 2017 - 9 a.m. - 1 p.m.
♦Saturday, November 18, 2017 - 9 a.m. - 1 p.m.
♦Friday, December 8, 2017 - 6 p.m. - 8 p.m.
♦Saturday, December 9, 2017 - 9 a.m. - 1 p.m.
♦Friday, January 5, 2018 - 6 p.m. - 8 p.m.
♦Friday, January 12, 2018 - 6 p.m. - 8 p.m.
♦Saturday, January 13, 2018 - 9 a.m. - 1 p.m.
♦Friday, January 19, 2018 - 6 p.m. - 8 p.m.
♦Saturday, January 20, 2018 - 9 a.m. - 1 p.m. Along with your registration, you will receive FIVE raffle tickets - these are YOURS, to keep or to sell to others, at $5 each, to put in your own pocket toward your registration cost. That means, if you sign up in the Earlybird time frame AND you choose to sell your raffle tickets for $25, you could be taking $60 off the regular registration price. If you choose to keep the raffle tickets yourself, you are more than welcome to do that, they are yours! You can put your name on them and return them to the office by opening day 2018 to be entered into a drawing for many great prizes! Noble Creek Park is located north of Interstate 10 on Oak Valley Pkwy, between Oak View and Beaumont Avenue. Our BYB office is located where the red X is displayed in the photo. Bottom border of photo is Oak Valley Parkway. ​Here's what our office looks like! 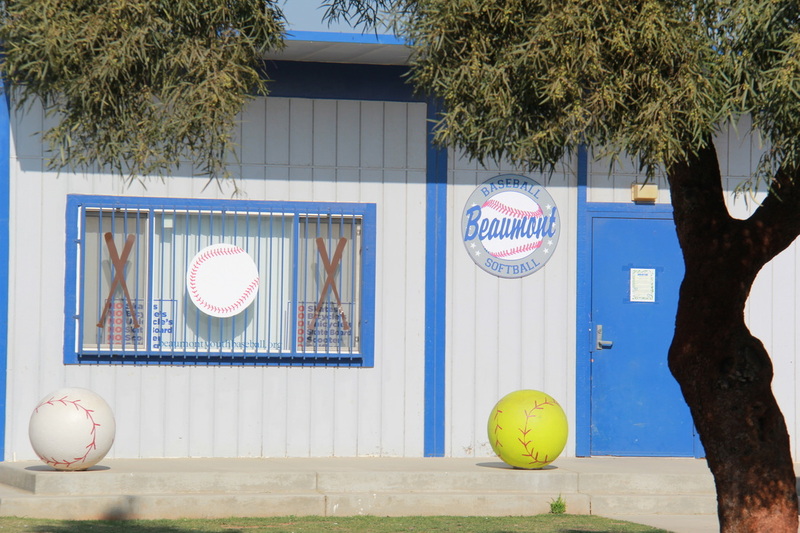 The Board of Directors for Beaumont Youth Baseball and Softball meets the first and third Tuesday of each month at 7 p.m. in the BYB office at Noble Creek Park, in Beaumont, California. Just a reminder that there is no parking allowed in front of access gates on the outfields around the park. Also, please remember, parking behind Field 1 Right, past the yellow gates, is for authorized vehicles only for safety reasons. If you want to park behind Field 1 Right, PLEASE park parallel to keep the roadway as wide as possible. Within the yellow gates is not an open parking area and the yellow gates should not be passed or blocked by parked cars in any way. In the event of an emergency on a field, we want these emergency openings available to first responders. Thank you for your understanding. Even the little guys help out with picking up the bases. Coaches/Managers/Parent helpers: PLEASE remember it's your responsibility to remove your bases and mounds at the end of your practices. Even though we have more than 1300 people who "LIKE" our BYBSB Facebook page, our posts are sometimes seen by only a small fraction of those people. 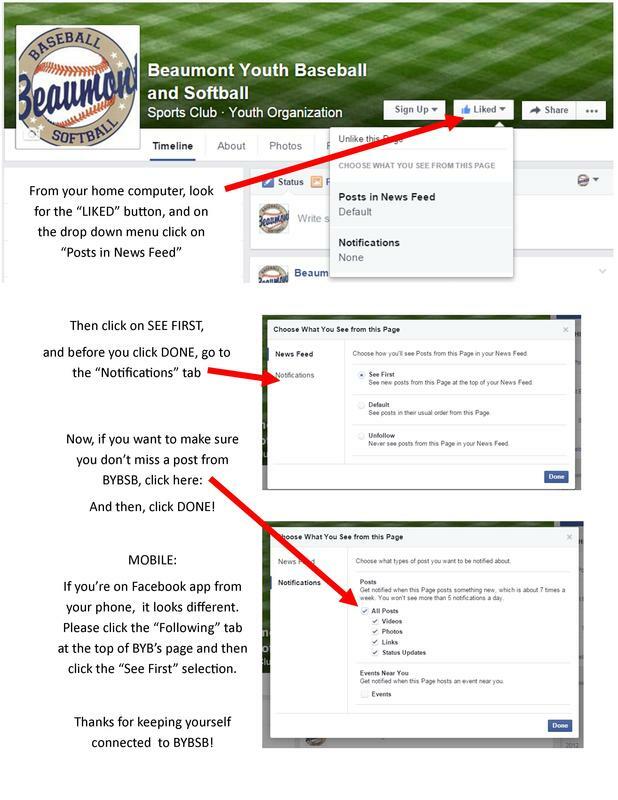 If you're missing some of our Facebook posts, here are some settings that may help. 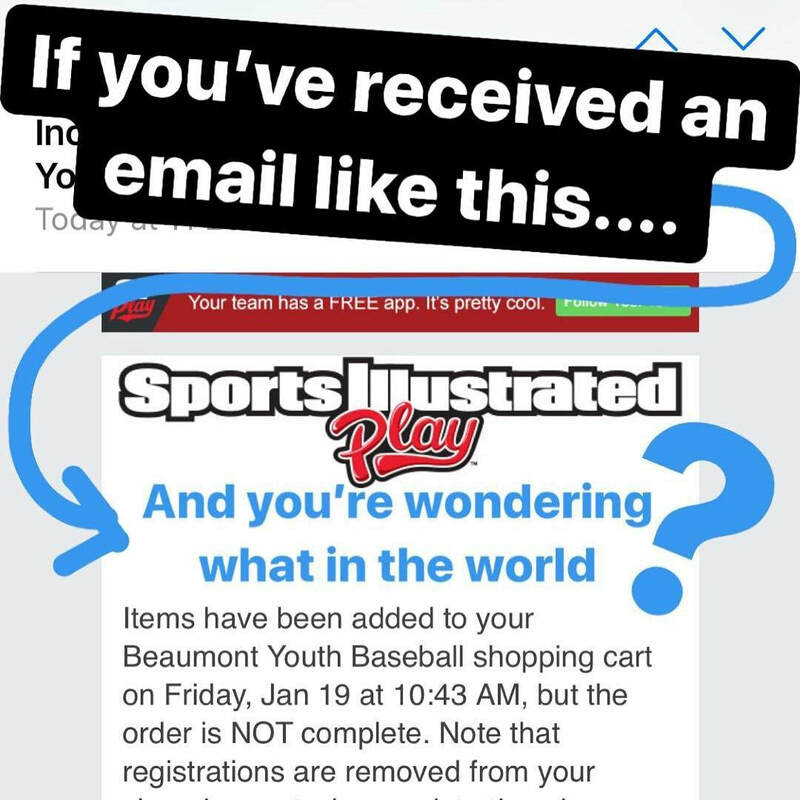 It's not BB (Beaumont Baseball). 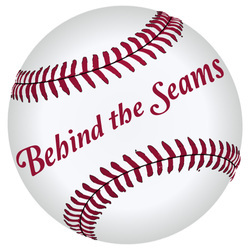 It's not BAB (Beaumont Adult Baseball). It's BYBSB. The Y is the entire reason WHY there's a BYB. Parents, coaches, umpires and fellow players are all to be respected, but also respectable. The players themselves also need to be respected, whatever ability and talent level they're at. This is all basic knowledge, but somehow throughout the season, things get a little serious among teams in any division, and we need a little refocusing. Whether you're a bleacher creature or a coach on the field, please remember the kids and how you want THEM to feel at the end of the game. Think of how you want THEM to have the desire to play again next season. Think of the values you want THEM to take away from this season. PLEASE revisit our Code of Conduct by clicking HERE. It shouldn't matter which side of the fence you're viewing the game from - good sportsmanship needs to be on the field as well as in the bleachers. As much as we encourage it in our players, we ask for it respectfully from our players' families and spectators. ENJOY THE GAME. And if you're not enjoying the game, get up and get a nice hot cheeseburger or some nachos from the snack bar. There's a 100% chance you'll feel better when you return to the bleachers with food! Here's a link to our Code of Conduct.